The FatMax technicians bag has a rigid waterproof plastic bottom, and an ergonomic rubber grip handle. 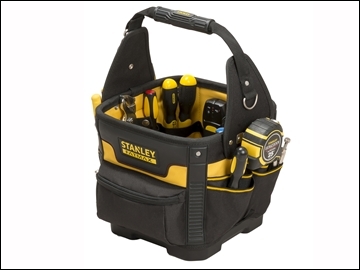 It has a removable divider and provides easy access to the tools. It is constructed from heavy-duty 600 denier nylon, and has a comfortable heavy-duty shoulder strap. Industrial leather reinforcements in key stress areas. It measures 28 x 29 x 38cm.